And then, in one moment, you can change that open terrace into a sheltered space by just sliding closed a few glass doors. Now you can be there throughout the year. Our sliding glass door system for terraces is weather tight and protects your terrace from rain, snow, and wind. Sliding glass doors can be an option almost anywhere, the only limit is your imagination. 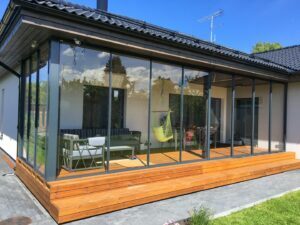 A sliding glass door system can significantly reduce the heating costs of a home.All the door frames correspond to the European Standard. The sliding system is bottom-attached onto tracks. The tracks are either two or four-lined, ​​and equipped with water emptying holes. Each door moves in its own track. Durable stainless-steel rollers, with nylon edges, facilitate the movement of the glass doors and do not require extra care. Rubber seals are used for fastening the glass to the aluminum frame. The frame has brush seals, which makes the entire system noise, water, and windproof. There are no mechanical parts to wear out. All doors are manufactured to order. They are unique and the final price depends on the materials used and their complexity. Installation of sliding doors is always possible.